WASHINGTON (CNS) — Since participating in the March conclave that elected Pope Francis, Cardinal Donald W. Wuerl of Washington has spoken about the experience to reporters and during Masses at local parishes. But his recent Theology on Tap talk to a standing-room crowd of between 300 and 400 Catholic young adults marked the first talk he had given about the conclave in a bar, and he smiled and confessed that it was also his first visit to Buffalo Billiards, a busy downtown pub where patrons in an adjoining room played pool and watched baseball games on big screen televisions. And while some members of his audience held glasses of beer as they listened, the smiling cardinal enthusiastically revisited his Rome experience and a few times held up a copy of his recent book, “Faith that Transforms Us: Reflections on the Creed,” as he encouraged the young adults to deepen their Catholic faith and share it with others. The cardinal opened his talk May 7 by joking about how, on the night before the conclave, he visited — but did not have anything to drink — a tiny bar in Rome that celebrated his hometown team, the Pittsburgh Steelers. “Two months ago in St. Peter’s Square, the whole world was looking at the chimney, waiting for smoke to come out,” the cardinal said. And when white smoke appeared, he said, the square soon filled with more than 100,000 people, many chanting “Viva il papa!” in Italian (“Long live the pope!”) even though they didn’t yet know who the new pope was. He noted that Jesus called the disciples who walked with him to be his witnesses, and bring the Good News to the world, and they shared that story and passed it, just as today’s disciples are called to do. The apostolic succession of the pope and bishops link today’s Catholics to Peter and the apostles and to Christ, the cardinal said. Cardinal Wuerl noted that St. Paul in his letters passed on what he had received — faith in Christ and his church. “The faith is something we receive and is this great gift,” the cardinal said. Then he smiled and held up his recent book on the Nicene Creed. The cardinal said he wrote the book to help Catholics deepen their faith in the Year of Faith opened this past fall by Pope Benedict XVI. Many reporters asked the cardinal if the new pope would change church teachings on abortion and sexual morality, and Cardinal Wuerl said that church teaching is not policy that is voted on, rather it reflects revelation that comes from God, and the pope and the Catholic Church are called to bring these unchanging truths to the world. “The task of the church and the pope is to pass it on,” he said. 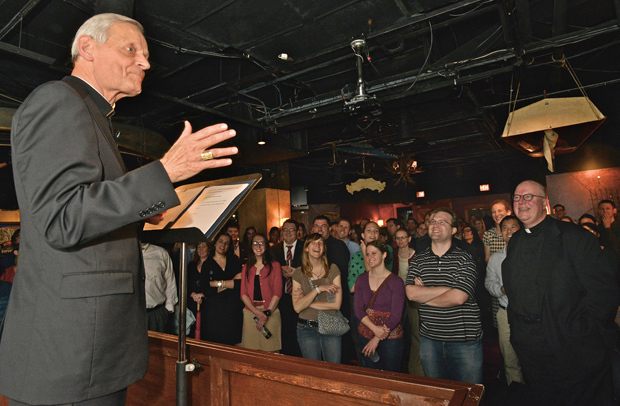 Church teaching, Cardinal Wuerl said, reflects God’s wisdom and Jesus’s call to love and serve others “as I have loved you,” and that will always be a countercultural message in a world that stresses personal fulfillment and materialism. “You and I are invited by Jesus into a way of life, to follow his Gospel, his message and walk with him through life,” the cardinal said. Reflecting on the new pope, Cardinal Wuerl said that from Pope Francis’ first appearance on the balcony of St. Peter’s Basilica, “he clearly captured the imagination of people around the world. … I think what people are saying is, this Holy Father is what we need today, a pope whose heart is the heart of a pastor, and who comes out of the experience of a diocese where he has been shepherd” in Buenos Aires, Argentina.